Campaigners have called the ruling, which could be implemented by 2022, a ‘landmark day for road safety’. 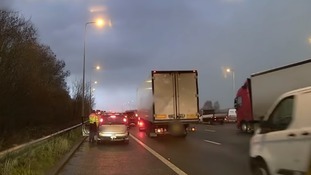 A Highways England patrol vehicle captured the crash on the M6 in Cheshire. Commons speaker John Bercow has told MPs he will confirm she is subject to a recall petition. Every motorist stopped by roads police officers from three forces in September will be required to take eye tests. Traffic jams are nobody's idea of a good time, but one driver in Ohio seems to have taken avoiding rush hour to the extreme. Novice motorists can have lessons on the 70mph roads if accompanied by an approved instructor and driving a car with dual controls. People who haven't yet passed their test will be allowed on motorways with approved instructors in a move officials say will improve safety. Extending the MOT free period from three years to four would save motorists money and bring the UK into line with other European countries. More than a quarter of those surveyed said they shout at other motorists, but would not do so in person. Research has shown motorists drive more slowly on roads without the central white line - cutting average speeds by 13%.